The latter of these was particularly strong this year and, consequently, played a major part in the race. In fact, it played such a major part that it led to the following stat..
Year of the cyclist in Kona this year: Bike split ~2.5x higher correlated with top 10 finish position vs run split for male AGers. The 70-80mi mark on the second part of the Hawi descent to Kawaihae. As I’ve said before, putting down power when air speed is high is, on the whole, a dumb move. The exception to this is when you have the ability to effectively escape that high air speed (that everyone else has to deal with) by finding a good draft. This is what the fast age-groupers did this year, they stayed together as a fast group through this section and created a gap that the trailing groups simply couldn’t make up. "In general, most triathletes simply aren’t aware of the draft benefit that comes from riding at a legal distance, especially in breezy conditions." Part of the reason for the above is that, until lately, not a lot of research has looked at this question (partly due to the problem of wind tunnel length!). However, a very interesting 2013 study by Blocken et al. may finally shed some light on the question. This Dutch research differed from previous 'drafting' research in 2 important ways: It measured drag at multiple distances behind the lead rider and ir measured the relationship between draft distance and the coefficient of drag area for different rider positions – including the TT position. These factors enabled them to identify the relationship between distance behind the rider and change in CDA for 2 athletes in the TT position. 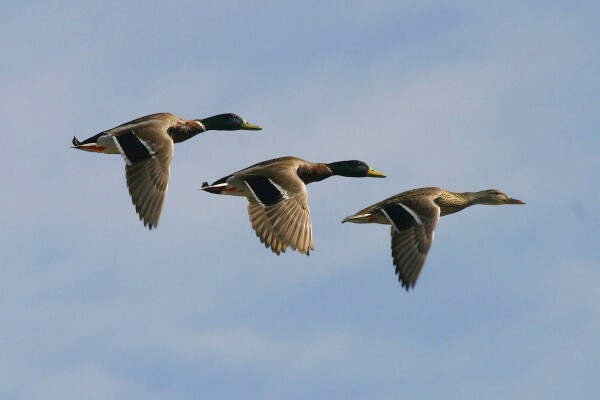 This relationship, at a relative air speed of ~35mph is shown below. 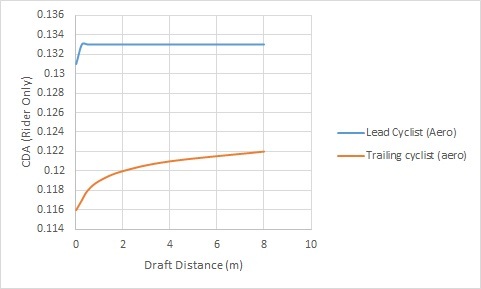 The trend that they observed was as follows: The draft benefit to the rear rider decreased by ~0.01m^2 for each doubling of the draft distance. If we extrapolate this out to Ironman's 'legal' draft ranges, it is clear that a material advantage will still exist at legal distances. To put this into a practical perspective from yesterday’s race, with head winds of 12mph, and ground speed of 23mph (lead of AG pack), i.e. relative air speed of 35mph, the difference in output for a legal group vs a solo athlete at this point would be in the vicinity of 25W. For an average size solo athlete (CDA 0.26m^2), ~285 watts vs only 260W for the same size athlete with the ~9% reduction in CDA that we see at the legal draft distance of 7m. While both of these numbers represent solid outputs, the difference is the better part of a zone! For this top level age-grouper, 285W is likely approaching or within the 'glycogen- chewing' threshold zone, while 260W represents a strong but sustainable output. In practice, this delta led to an effective widening of the gap at this point in the race, where a solo guy would have to have ridden significantly above 285W to bridge up to, and join, this fast rolling group. This is bordering on prohibitive (or, at the very least, Kamikaze-like) wattage for most of the AG field. The fast moving pack of guys at the front of the race clearly had a benefit at this point. Of course, this benefit pre-supposes that you find yourself with a group of similarly minded individuals who also want to ride aggressively at that point. Competitive age-groupers who were not as fortunate (sensibly) elected to push average watts and sit in where they were rather than go it alone. This difference amounted to ~10minutes over that 20mi split! So, under these conditions, the race becomes a bit deterministic. If you’re not at already at the front with these guys, you would have to roll significantly more than 285W solo to bridge up and catch them! For this reason, under these conditions, the gaps between the packs widen and the rich get richer. Don't miss a post! Sign up for my mailing list to get notified of all new content. Have no fear - I won't spam you or sell your info.